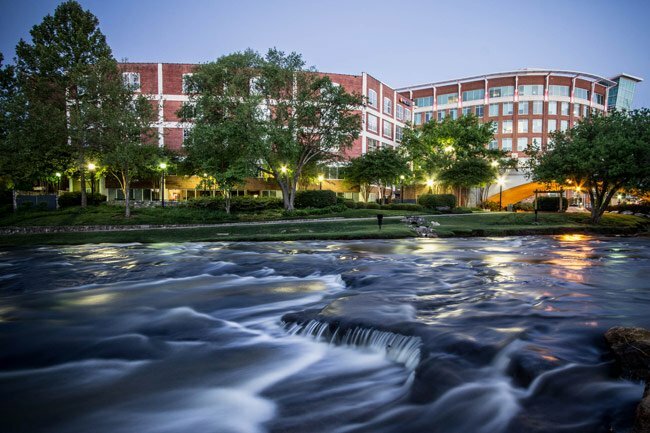 Rising in the foothills of the Blue Ridge Mountains, the Reedy River flows southeast through Greenville County and winds its way through the heart of downtown Greenville. In the center of the city, the river drops significantly to form Reedy River Falls, the focal point of beautiful Falls Park. From there it continues to flow south into Laurens County where it eventually joins the Saluda River at Lake Greenwood. In the late 1700s, European settlers purchased land along the Reedy River and established grist mills and trading posts. The river became the center of Greenville’s growing economy, and by the late 1800s the grist mills had given way to textile mills. Unfortunately, the Reedy suffered greatly from the city’s progress as it became polluted and unsuitable for recreational activities. It wasn’t until 1967 that the condition of the river began to improve. The Carolina Foothills Garden Club reclaimed 26 acres along the Reedy in downtown Greenville to be developed as the popular Falls Park. Since that time, the Garden Club and the City of Greenville have worked alongside various state and federal agencies to develop the park and clean up the river. Recently, the South Carolina Department of Natural Resources and other groups have created a watershed planning guide to further ensure the health of the river. As a visitor, I took the same photo as Jenny Munro (above). I was trying to find the name of the green bridge (still haven’t found it) and came across her photo.Greenville is a great town to visit, Falls Park on a spring day is lovely, good shopping and eating and people watching. Loved it. i used to live next to here and it was much fun to swim in but the current was strong. I got married at the falls by the grotto and can’t seem to find pictures of that specific area. I would love to find the coordinates for the area as well. Any help would be greatly appreciated! This is such a beautiful place! If I ever get to South Carolina to see my brother in Ridgeway and my son in Charleston, I will just have to stop for a visit! Great place to see! I live in Penrose/Canon City, Colorado. 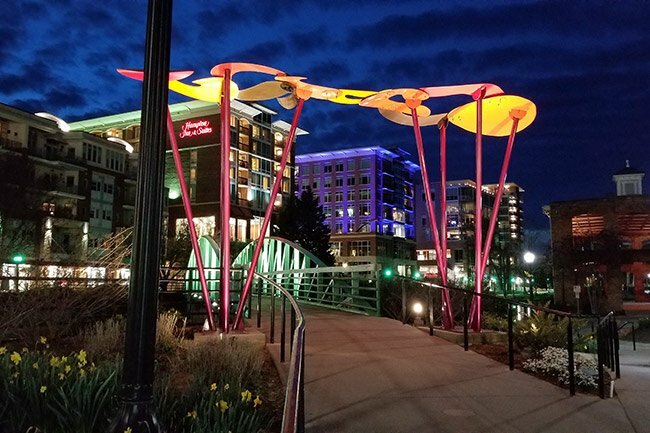 This is beautiful and in the heart of downtown Greenville!